Parallax can mean different things in different sciences (See, for example, this link that describes how parallax is used to compute distances in astronomy), but in satellite meteorology, parallax is the apparent shift in an object’s position (away from the sub-satellite point) as a result of viewing angle. (Here is an example.) Parallax generally increases as you move away from the sub-satellite point. It is also large for higher clouds. Consider the simplified example below. It shows a lake (blue surface) viewed obliquely from a distant satellite. So this surface feature is far from the sub-satellite point. If a very tall cloud develops between the surface lake and the observing satellite, the satellite will still interpret the information as coming from the surface — that is, where the lake is. In reality, however, the tall cloud is displaced towards the sub-satellite point. Note also another consequence of the viewing angle: the temperature of the cloud will reflect the temperature of the side of the cloud that the satellite is viewing. The colder cloud top will be in a different pixel. Parallax in geostationary imagery becomes obvious when cloud imagery is compared with surface-based observations. 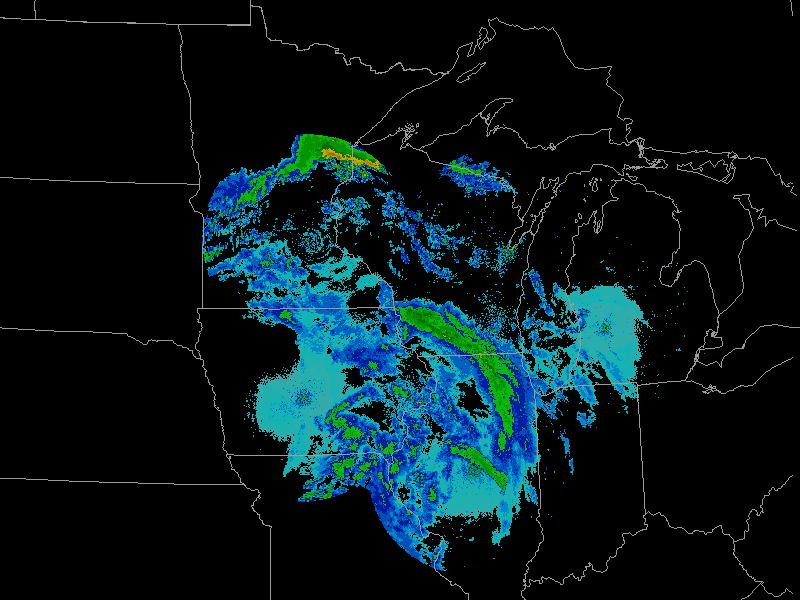 The example below is from April 2006, and shows strong convection over northern Wisconsin just south of Lake Superior. 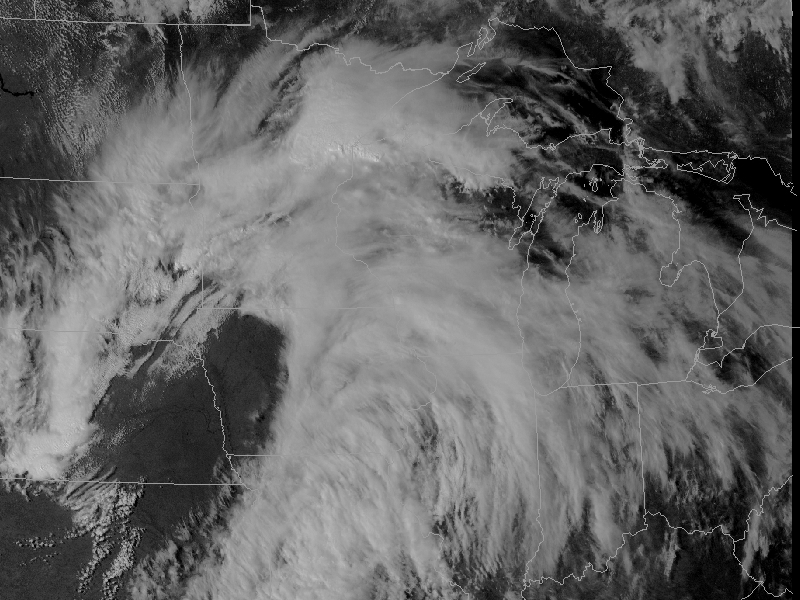 More modest convection is over southern Wisconsin near Madison. 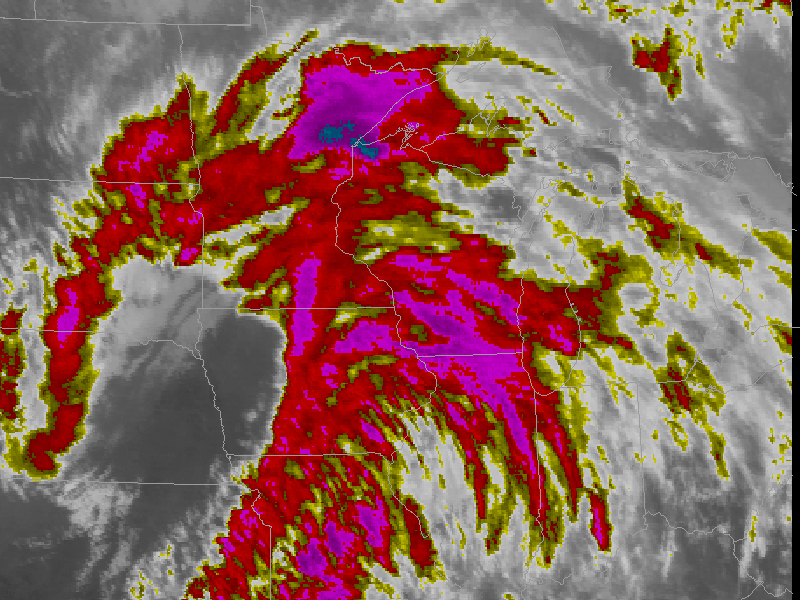 The enhanced infrared imagery can be used to infer the height of the cloud (cold clouds are usually higher in the atmosphere). Displacement (parallax) is greater for higher clouds. The coldest clouds are associated with the convection just south of Lake Superior. The radar for the same time shows a line of convection displaced to the south of the convection. The displacement is difficult to see in the three individual images, but stands out in the fader that can be seen here (Link requires Java). The bottom line: when you see a very cold cloud top on satellite imagery, and the cloud top is far from the sub-satellite point, it’s very likely that the position of the cloud feature over the surface is closer to the sub-satellite point than is indicated in the image mapping. It is also possible to remap the satellite image, rather than the storm report. The GOES-14 satellite image below was first remapped to a Mercator projection, and that image was then parallax corrected (using infrared imagery to estimate the height of the cloud; note that low clouds show very little parallax correction). Added, 2017: The National Weather Service Operational Proving Ground produced a YouTube video, below, discussing the causes and effects of parallax. Here is an example of how parallax affects the apparent displacement of convective cloud top features when viewed from GOES vs. the polar-orbiting MODIS instrument — note how the coldest cloud top pixel on the “MODIS IR Window” image is about a half a county farther south that on the corresponding “GOES IR Satellite” image (in this case, half a county ends up being about 20 miles).